She will take great care of you & your brows! Receive an expertly shaped brow, perfect for your individual eye and face shape. Create a subtle, natural looking lift, giving the illusion of length, and making the eyes appear more open. 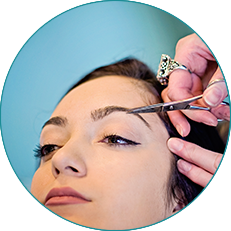 Your one stop destination for perfect eyebrows! Schedule an online appointment with us today, whether you need eyebrow shaping and tinting, permanent make up or a flawless airbrush make up application for a special occasion.... We can create the perfect look for you! We perform all of our waxing services with an extremely gentle lavender azulene wax, leaving the skin soft and free of hair, with little to no redness. 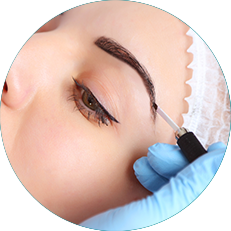 3D eyebrow microblading is a semi permanent tattoo procedure. Fine, hair like strokes are made using a hand held tool and pigment is deposited underneath the skin. This technique enhances your natural brow shape and fills in sparse areas. Results can last, on average, from 18 months to 2 years. We use medical grade prescription numbing cream to make the treatment virtually pain free. For more details and FAQs, visit the FAQ section. 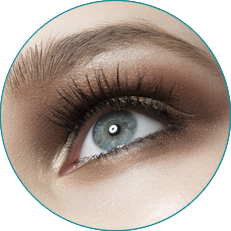 Make your eyes pop with our new lash lift service! By lifting the lashes at the roots, we create a longer looking lash and also give the eyes a much more open appearance. This service is performed on natural eyelashes and it also includes an eyelash tint. Results last for 6 to 8 weeks with no maintenance! Our airbrush foundation provides a flawless, long wearing, custom blended color base for your make up application. Allowing for buildable coverage from a light natural glow to full coverage, this foundation will stay in place for 12 hours and photographs beautifully. **We require a $100 non-refundable deposit to hold your appointment for microblading. There is a 48 hour cancellation policy with the deposit. If needed, please cancel or reschedule your appointment more than 48 hours prior to your appointment in order to keep the deposit. Your deposit will be subtracted from your total due on the day of service. Deposits can be paid through an invoice that we can email to you. See our work and get ideas of how Browz can help you look your absolute "BEST"!